National Accreditation for PET/CT Scanner – We are proud to announce the arrival of our GE 16 slice PET/CT scanner. Our PET/CT scanner is accredited by the national accreditation organization American College of Radiology (ACR) mandating diagnostic quality and safety standards. 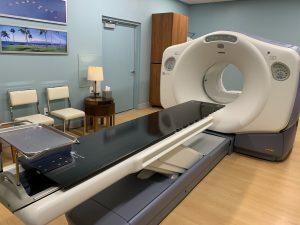 The addition of PET/CT scanner to the Cancer Center will significantly benefit both our patients and patients in Bay County and the surrounding Medical Communities as a non-invasive detection and staging of cancers, neurological conditions and cardiovascular diseases. With an order from the referring physician Hope Regional Cancer Center will now be able to perform the PET/CT for your patients. You will receive prompt interpretations from the trusted and dedicated team of Board-Certified Radiologists from Bay Radiology. You can also be confident that your patients will receive the best care that they deserve from our dedicated staff at the Cancer Center. Please call our friendly staff at 850-481-1687 today to schedule your patients PET/CT scanning need. Immunotherapy is a treatment that uses the power of your body’s immune system to attack cancer cells. Your immune system is a collection of tissues, organs and cells that work together to protect you from infections and diseases. It can keep track of the substances normally found in your body. New “foreign” substances that the immune system doesn’t recognize cause it to go into self-defense mode to protect you by killing off these invaders. Cancer cells are foreign to the body. As such, once the immune system recognizes the cancer cells in the blood stream, it then activates the T cells and other immune cells within the lymph nodes. These T cells are then transported to the site of the cancer location, where T cells recognize and kill the cancer cells. Cancer Vaccines: Immune system cells are removed from the patient’s body, which are then sensitized to the cancer cells. The cells are infused back to the patient, which produces immune response to the cancer. Provenge vaccine is now approved for prostate cancer treatment. There are other cancer vaccines under development. Monoclonal Antibodies: These are man-made versions of immune system tumor specific proteins that are designed to attack a specific cancer cell. Herceptin is a monoclonal antibody used in treating breast cancer. Immune Checkpoint Inhibitors: These drugs alert and activate the immune system so tumor cells have no place to hide from the immune system. Most recently, Keytruda was approved for melanoma treatment and Opdivo was approved for lung cancer treatment. Immunotherapy is administered through an IV or as a pill. Today, it is being used to treat many different types of cancer including melanoma, breast, lung, gastric, colorectal, cervical, kidney, bladder, prostate and ovarian cancer. Immunotherapy is a relatively new therapy in the cancer fighting arsenal. It has been found to be effective for certain cancers when other treatments are not. As a combination therapy with other treatments, it may help them to work better. Side effects such as flu-like symptoms, fatigue, rash and dizziness may occur during or after treatment. Fortunately, the Bay County community now has access to these novel immunotherapies at Hope Regional Cancer Center. If you are diagnosed with a cancer, before undergoing any treatment, you should talk with several cancer specialists to find out which treatment options are appropriate for you.